From May 1988 to December 1988 260 patients (188 female, 72 male, mean age 50 years) with symptomatic gallbladder stones underwent single treatments with extracorporeal shock wave lithotripsy (ESWL†), using the Dornier MPL 9000. 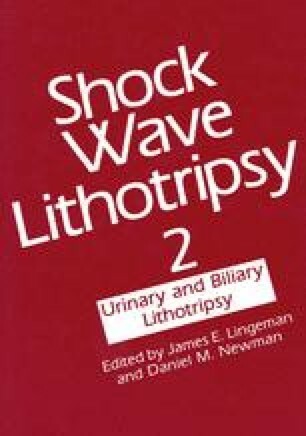 The average number of shock waves was 1,617; the mean power was 18 kV. No severe adverse effects were observed. Patients were divided into two groups, Group I had three or fewer stones (n=165) and Group II had more than three stones (n=95). The overall fracturization rate was 99%. In both groups the mean reduction of the initial stone diameter was 47%. Although Group I had a mean initial stone volume of 4,100 mm3 and Group II had a mean initial stone volume of 2,600 mm3, the percentage of patients with remaining fragments of 5 mm or smaller was comparable (Group I, 36%; Group II, 33%). Compared to initial stone volume, the mean reduction of stone volume three months post-ESWL was 63% in Group I and 71% in Group II. Calculation of percent of reduction, based on comparable units of initial stone volume, showed no difference between Group I and Group II, which seems to justify the possibility of treating patients with more than three gallbladder stones.